Graduate emissaries introduce graduate opportunities to diverse and talented prospective graduate students. 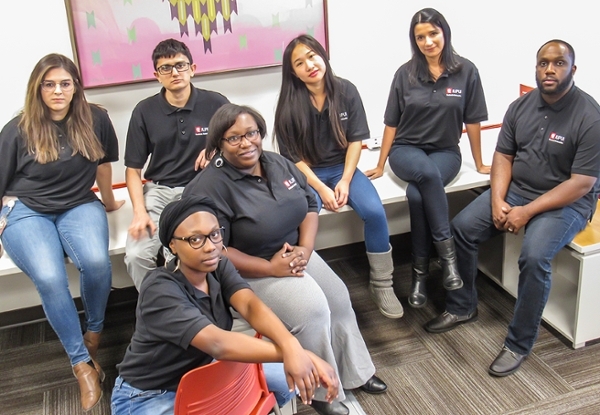 The goal of the Graduate Emissaries for Student Diversity program is to connect trained IUPUI graduate and professional students to serve as program ambassadors and assist in the various stages of the graduate process. A major function of emissaries is to provide for the interchange/exchange of information that facilitate progression and successful completion of their graduate student programs. Emissaries will serve as initial peer contacts for pre-application graduate and professional students and will also work to build a more inclusive graduate student community through formal and informal mentoring activities. Additionally emissaries will assist in creating a welcoming campus environment, networking support, and providing information and referrals to on campus resources and services particularly for underrepresented and minority students. Graduate emissaries play a critical role of introducing graduate opportunities to diverse and talented prospective graduate students. Using effective peer-to peer communication channels, emissaries will work to positively support the university’s recruitment, outreach and advocacy efforts across diverse communities. Emissary activities must comply with University Graduate School, and Indiana University policy, and regulations. Emissaries will receive a small stipend each semester that they serve and report directly to Dr. Tabitha Hardy, Assistant Dean.